Shakespeare in the Park is an annual event, with free plays produced by The Public Theater staged at the outdoor stage at Central Park’s Delacorte Theater. Two plays are presented each summer. The productions often feature well-known actors and directors. Shakespeare in the Park is free to attend, but you can’t just walk up to the door and get in. This is a very popular event and tickets aren’t necessarily easy to get. You’ll either need to wait in line or try your luck with the ticket lottery. All shows start at 8:00 p.m. The folks at Shakespeare in the Park take the concept of “the show must go on” pretty seriously. Here’s a quote from their website regarding weather, “We will never cancel a performance before it is scheduled to begin. Rain at 7:30pm may clear by 8:00pm, so it is best to always assume the show will perform as scheduled. In the event of rain or severe weather, the start of the performance may be delayed; however, the performance will begin as soon as it is possible to do so. Performances may also pause for sudden changes in weather, but will resume as soon as weather permits.” You can’t use umbrellas in the theater, so if the weather is iffy, bring some rain gear. Here are five ways you can get free tickets. You can wait in line (often a long line) at the Delecorte Theater on the day of the performance. The tickets are distributed at noon, on a first-come-first-served basis. Each person age 5 and older can get up to two tickets, while supplies last. Some people start lining up before the park opens at 6:00 a.m.
You can wait in line at one of the alternative ticket voucher distribution locations throughout the season. These alternative distribution sites change daily and are primarily located outside of Manhattan. See the boroughs ticket distribution schedule. You can try the in-person lottery at the Public Theater downtown. A limited number of vouchers are available through an in-person lottery held at the Public Theater’s downtown facility on the day of the performance. The address is 425 Lafayette Square at Astor Place. Sign-up for the lottery begins in the Lobby of The Public at 11:30 a.m.. The lottery will be drawn at 12:00 p.m (noon). Each entrant (age 5+) if selected, is allowed two (2) vouchers, and each voucher is good for one ticket. Those selected must redeem the voucher(s) for ticket(s) between 5:00 p.m. and 7:30 p.m. at the Delacorte Theater Box Office. Vouchers are only valid until 7:30 p.m. for performances on the day they are issued. Please visit the Public Theater website to verify details. Or, you can enter the virtual ticket lottery online to try to get tickets. You can enter the lottery between midnight and noon on the day of the performance and you’ll receive an email after noon letting you know if you were selected to receive tickets. The last-minute option is to try the standby line at the Delacorte. The standby line starts forming after the last tickets for that day’s show are distributed. Unclaimed tickets are distributed, one per person, if available. See the Tickets page at the Shakespeare in the Park website for details. 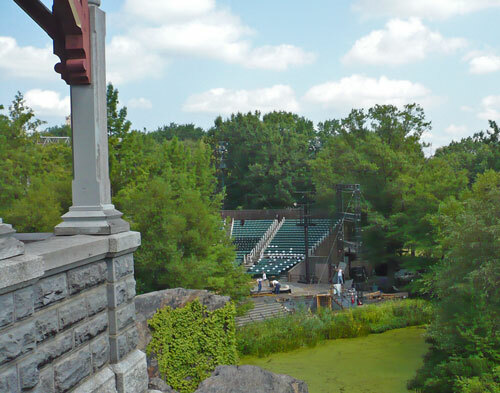 Shakespeare in the Park productions are held in Central Park’s Delacorte Theater, an outdoor amphitheater located mid-park at 80th Street. The 2017 Shakespeare in the Park productions are Julius Caesar and A Midsummer Night’s Dream. May 23 – June 18, 2017 – Julius Caesar. A contemporary rendition starring House of Cards cast members Corey Stoll and Elizabeth Marvel, plus Tony Award winner Nikki James and Pulizer Prize winning playwright Stephen Adly Guirgis. July 11 – August 13, 2017 – A Midsummer Night’s Dream. Directed by Lear deBessonet. Cast includes Broadway actors Annaleigh Ashford (Sunday in the Park with George) and Danny Burstein (Fiddler on the Roof). All performances begin at 8:00 p.m..